The sight of kites flying high in the skies being joy to the beholder but runaway kites are an increasing threat to local birds that become entangled in the strings. Art master Shantha K. Herath was conducting a class last week when he heard a loud, stressful cry from the top of a tall jak tree. He rushed out and found a large bird trying to escape from a string that had wound around its legs. The struggles of the large purple heron (karawel koka) made the problem worse. Villagers who gathered to see the plight of the bird called the Wildlife Department, which dispatched a local wildlife team to rescue the bird. 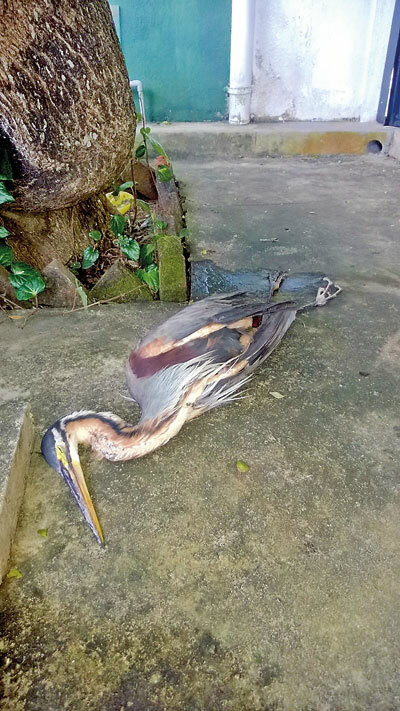 About a month ago, Udeni Seneviratne shared on Facebook an incident in which an oriental darter had one of its wings entangled in a kite string. Unable to bear watching the bird’s distressed attempts to escape, animal lovers decided to attempt a rescue but it was dangerous as the bird was high in a massive flamboyant tree where its panicked struggles could unsettle a rescuer, with a slip of the foot being fatal. Eventually, the brave effort gave the oriental darter another chance in life. “We were happy to see the bird swimming off but its wing was injured,” Ms. Seneviratne stated. The Wildlife Department sees at least one such victim a week in the kite-flying season but the real number of dead and injured birds would be greater, the veterinary surgeon at the department’s Wildlife Rescue Centre at Attidiya, Dr. Suhada Jayawardane, said. “It is often very difficult to rescue the birds as they often become entangled high in trees,” Dr. Jayawardane said, recalling when the fire brigade had to be called in to rescue a brown-headed barbet that had become entangled near Ananda College, Colombo. In India and Pakistan, where kite flying is a popular pastime and participants compete fiercely for dominance of the sky, a kind of glass-coated kite string (locally called manjha) is used and this is particularly dangerous for birds. According to a Times of India report, 4,026 birds had to be rescued during a kite festival at Gujarat, and according to a conservator of forests the previous year’s toll was worse, with 8,300 becoming entangled in kite strings and having to be rescued. Glass-coated string is not used in Sri Lanka and should not be allowed as it slices through the throats and membranes of birds. Dr. Jayawardene said it was difficult to treat a bird with broken wings and pleaded with kiters not to leave runaway kites and their threads unattended. The veterinary surgeon also asked anyone who spotted abandoned kites to remove them. The problem is not only in the sky: different lines trap marine life deep in the oceans. Abandoned, lost or discarded fishing gear is a serious problem, more so as, unlike in the case of kite strings, the equipment is especially designed to trap the fish. This entry was posted on September 16, 2018 at 18:30 and is filed under Uncategorized. You can follow any responses to this entry through the RSS 2.0 feed. You can leave a response, or trackback from your own site.